The yellow vests insurrection offers lessons beyond or in parallel to the often celebrated insurrections of the Zapatistas in Chiapas and of the Rojava “Revolution”. In no way dismissing these latter, the yellow vests speak more directly to those living in the “advanced” capitalist states, where indigenous populations, the peasantry, regional ethnic identities, industrial working classes have all waned or disappeared (never peacefully). The yellow vests are a premonition of what insurrection, revolution, may be in the end times of ecological collapse and neo-liberal authoritarianism. Rebellion will no longer be the act of a “people”, of a “class”, in any unified sense of these terms. It will be, as is the yellow vests’ insurrection, a plural and contradictory rebellion, created and defined in the movements of the movement. It will have no end beyond itself (none can be outlined); it will not be a means to an end, or an end justifying all means. It will be a permanent rebellion where social relations remain plastic, constantly changeable, fleeing from and struggling against those who would seek to harness the wild energy unleashed. In the midst of this an-archy, we catch a glimpse of autonomy. Yet again, we see the yellow vest movement haunted by its unsuccessful struggle to dissociate itself from reactionaries. The fact that members of the far right were in charge of security enabled other fascist groups to gain a foothold. On January 26, 2019, for the second week in a row, a group of fascists, known as Zouaves,attacked the anti-racist and anti-capitalist march. The following weeks, anti-fascists and other yellow vesters struck back, expelling fascists from the demonstrations. Elsewhere in France, similar struggles took place, notably in Lyons, where the streets became a battlefield between fascists and anti-fascists. At 10 am, the author answered the call to gather in front of the Saint-Lazaretrain station, before joining the yellow vest demonstration at the Champs-Elysées. Rapidly, hundreds of people started moving towards their destination. The first slogans against President Macron rang out in the rich districts of Paris. Reaching Rue de la Boétie under the collective chant of “Paris, Paris, soulève-toi!” (“Paris, Paris, rise up!”) the crowd comprised about a thousand people. After passing through several streets and crossing a shopping arcade, the march reached its morning objective: the Champs-Elysées. Unfortunately for the author, it was impossible to leave the Champs-Elysées,as police were blocking all the major exits. They continued walking up and down the avenue while observing scenes of joyful chaos. While some rioters looted every store in the avenue, others were constantly attacking and harassing law enforcement. The Fouquet’s caught fire for a second time while police continued to cover the street in tear gas. On March 16, the authorities had very clear orders regarding how to contain the demonstrations. In the past, authorities have changed their strategies according to what they were dealing with. During the Loi Travaildemonstrations in 2016, close contact with police forces was the norm; last May Day, authorities decided to stay away from us to avoid any injuries in their ranks and let us smash everything, afterwards using the images to target radicals. 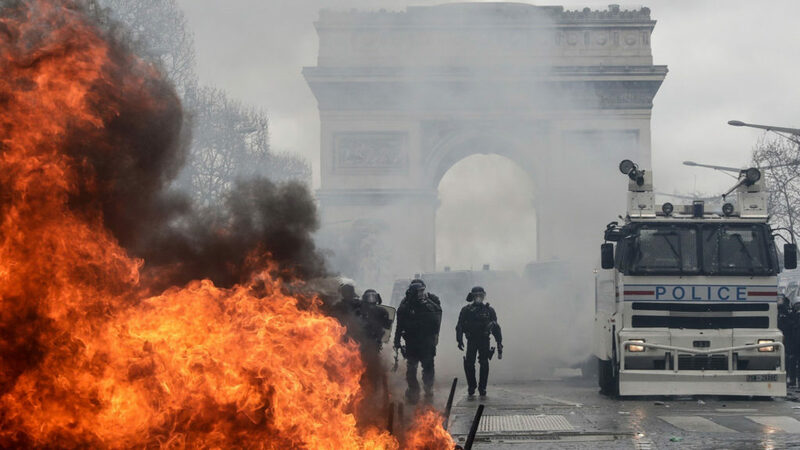 The other reason why the movement was able to defeat the government last weekend is that the yellow vesters present in the streets of Paris stayed side by side with rioters, even if they were not involved in street actions themselves. By doing so, they prove that the government’s strategy of dissociating “good demonstrators” and “rioters” is completely obsolete. The government still doesn’t understand how riots and other experiences in the streets can radically change individuals and their perceptions of the world that surround them. For example, last weekend at the Champs-Elysées,yellow vesters cheered when a group of autonomous rebels arrived near the Arc de Triomphe with a reinforced banner to confront police forces. This entry was posted in Commentary, News blog and tagged anarchism, france, gilets jaunes, insurrection, revolution. Bookmark the permalink.